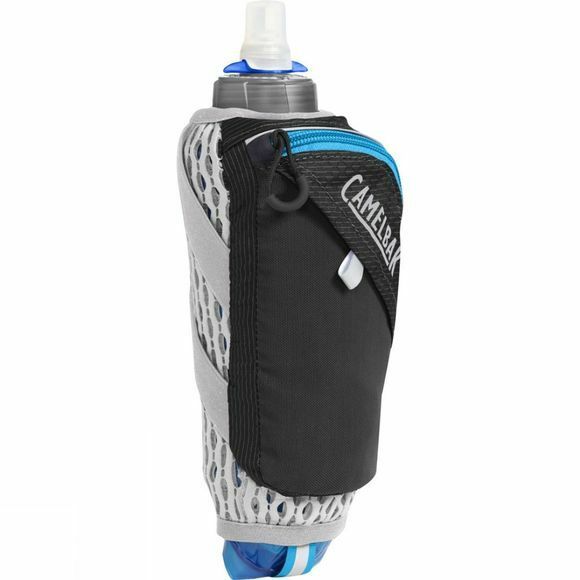 The Ultra Handheld Chill Bottle from CamelBak is a 500ml, insulated, collapsible flask that moulds to your hand and keeps your water cold twice as long as a normal bottle, but without the extra bulk and it’s so light and comfortable that you’ll almost forget you’re carrying it. It is surrounded by a 3D Ventilated lightweight mesh which offers multi-directional air flow and cushioning to maximise comfort and breathability for your hand when carrying. The secure elastic strap system lets you customise your hold so you don't drop it even if you relax your grip. It features a secure zipped pocket for quick access and storage for the important bits you need such as keys, phone or cards so you don't need to bring a bag on a run or a long walk. There is also a small stretch pocket to store extra fuel for those particularly long runs. It is highly reflective which will help increase your visibility on early morning or evening runs.